The CLe Dishwasher is so efficient, it can clean up to 8,550 dishes an hour with 50% less rinse water and energy and in less space than comparable models. The conveyor dishwasher of the future is here and because it’s a Hobart, it’s built to last for years and years. Opti-Rinse™ is only the beginning of the new and innovative technology you’ll find in the CLe Dishwasher. From the Power Scrapper to the patent-pending thermal layered curtains, the CLe features the most advanced technology in dishwashing today. Its energy and water efficiency has earned it an ENERGY STAR® rating. When it comes to saving, Hobart CLe dishwashers let you really clean up. Strong and powerful spray forms an S-shaped pattern. Start by saving up to $9,192 a year. 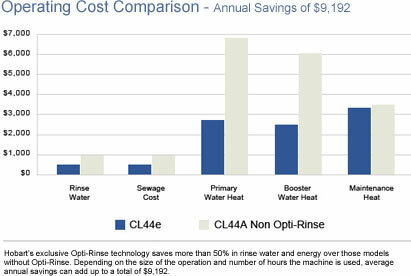 That’s how much you could save with Hobart’s exclusive Opti-Rinse™ technology. Opti-Rinse technology reduces water consumption so dramatically, the final rinse water required could be as low as .39 gallons per rack. A small boost for big savings. The CLe is so efficient, the specifications for a booster heater continue to be reduced. Small in size, it costs less and requires less energy. To preserve energy, the CLe has an Auto-timer that automatically shuts off the pumps and conveyor after a preset time, once the rack exits the machine. It restarts the warewasher when a rack re-enters. And every CLe Dishwasher has an exclusive Energy Saver mode that can be set by the customer to automatically shut off the entire dish machine, except for the controls, after one to six hours of inactivity, for even more saving. Even Hobart’s tanks are designed to save you money. They’re deeper, creating a smaller surface area, which helps maintain water temperature and reduces energy. The deep-tank design also requires fewer refills, saving water and detergent, too. The cascading water system on the multi-tank models replenishes each tank with the heated water from the prior tank as it goes from the final rinse to prewash zone, saving energy and water. Hobart’s patent-pending thermal layered curtains reduce heat loss at both the load and unload ends on an average of 2ºF to 3ºF. And the door-actuated drain closures ensure that the drains are closed—saving water, energy and detergent. There’s even a highly effective Power Scrapper prewash specifically designed for heavier food-soil removal. It uses the heated, detergent-filled water from the wash tank, saving not only water and energy, but labor and detergent, too. The wash water also stays cleaner longer, reducing the need for refills. 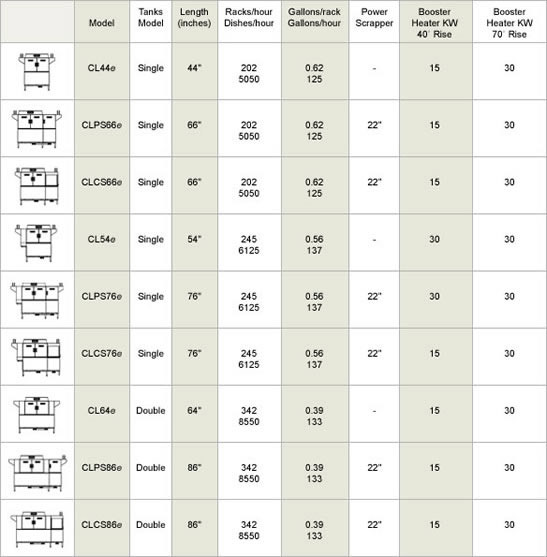 Hobart CLe Dishwashers offer unrivaled reliability and durability for lower cost of ownership. A machine doesn’t become the most popular conveyor warewasher in the industry unless it delivers day in and day out. Over the decades, you’ve come to rely on our durability and performance. Your trust is well founded. Hobart Warewashers have the highest documented uptime in the industry. Hobart, CLe and reliability are one and the same. Painstaking attention to all the details. Its durability and long life start with a heavy-gauge, stainless steel frame, legs and tanks, which together add greater strength and structural integrity to the entire unit. The dual-point drive reduces stress on the conveyor drive for increased reliability. The double-walled, insulated stainless steel doors and heavy-duty stainless steel brackets stand up to the toughest possible use. Features that add peace of mind and protection. A variety of features helps ensure that the CLe is reliable and hard-working. The self-draining stainless steel pump and impeller provide trouble-free longer life and no bacteria-laden water in the pump. And an integrated pump intake screen keeps debris out of the pump, reducing downtime. The screen is removable for easy cleaning. Opti-Rinse nozzles are made of KYNAR® resin to resist corrosion, chemicals, clogging and heat. As a result, the nozzles last longer. The CLe provides low-water sensors in the wash and power-rinse tanks to protect heating elements. And the fully wrapped front, bottom and side panels help safeguard the electrical components, including the motors, from possible moisture damage. Never has so much productivity been so easy to use. To tell how well the CLe Dishwasher is performing, all the operator has to do is glance at the digital display to verify the machine status and temperatures. The CLe’s conveniently located, top-mounted, NAFEM Data Protocol compliant controls can be programmed to notify the operator when it is time to delime the machine or to take necessary action if low temperatures or dirty tank water is detected. 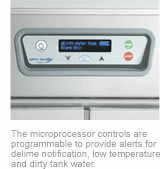 And the auto-fill feature simplifies operation while ensuring optimum tank water levels. The CLe Dishwasher is very considerate of your staff’s comfort, too. The insulated front of the CLe model not only helps keep the heat—and noise—inside, but also makes the outside cooler to the touch by 33%. Up to 8,550 dishes an hour. There’s a size and model of CLe Dishwasher to match your operation’s volume and specific dish-soil-removal needs that will keep your staff productive and your dishroom running smoothly. Choose the model that’s right for you—from 202 to 342 racks per hour. That translates into 5,050 to 8,550 dishes. Rapid Return. Built into every CLe Dishwasher is the exclusive, patent-pending Rapid Return™ drive system that delivers a more consistent and even motion of the racks through the dishwasher, improving the wash and rinse results. Further ensuring a smooth operation is Hobart’s dual-pawl drive mechanism, which reduces jams by simultaneously pushing the racks from each side, allowing for a full wash and rinse spray pattern across the ware. Exclusive wash manifold design. Hobart’s Computational Fluid Dynamics (CFD) wash manifold design increases wash performance by up to 5% over conventional models. This exclusive feature creates a more balanced wash pattern that allows for a larger separation between the wash and rinse zones, and also minimizes the carryover of food soil and cooler water into adjacent tanks. Hobart’s optional DDU38 direct-drive unloader indexes the rack out at a 90-degree right angle to save valuable floor space. Easy to install and, if necessary, simple to service. With single-point drain, water and electrical connections, installation is simplified. The CLe can also be converted to low- or high-temperature sanitation in the field. Diagnostics built into the dishwasher’s software makes service more efficient. Which means you can be up and running faster, with less downtime and at a higher level of efficiency than ever. Inch for inch, the most productive and accommodating conveyor warewashers in the industry. The Hobart CLe packs more productivity into every square inch than ever before. That’s what let us reduce not only the number of models but also the whole line to a very accommodating length—from 44" to a maximum of 86". Our longest model is now a full 38" shorter. That means you can pack more productivity into even smaller dishrooms. To assist you in specifying your next CLe Dishwasher, contact your local Hobart sales representative for a no-obligation site survey to analyze your needs and provide an efficient dishroom analysis, highlighting areas that will reduce operational costs and improve productivity. The doors on the CLe open a new era of easy access and cleaning in conveyor-type warewashers. The CLe Dishwasher’s large, hinged doors open wide for easy access to the machine’s interior. Inside you’ll find that the stainless steel Computational Fluid Dynamics designed wash arm manifolds are not only easy to take off and clean, but they’re also self-aligning, ensuring proper positioning and a uniform spray pattern. And the Auto-Position™ rinse arms are designed to ensure that the rinse arms and nozzles are properly positioned for a consistent, sanitizing rinse pattern. Easy to access and simple to clean. The easy-access drain lever is located outside the water zone for operator convenience. And a single strainer pan and basket mean fewer things to remove for breakdown and cleaning. The wash pipe is also mounted on the exterior of the machine, providing a clutter-free interior, further simplifying wipe-down.